A great match coming between Great teams.Both the teams looks good on paper and played good on ground recently with six win consecutively. brazil is in form and france has not even lost a match after the world cup.Thiago silva is playing after wc for brazil in this match. brazil playing well after losing wc in 2014 and looks tonight they will win too.France goal keeper is out because of injury so its little disadvanvantage for them. 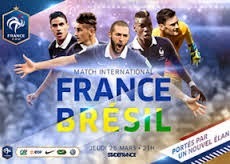 last time both teams meet in 2013 friendly, brazil won that by 3-0. but france is much better in these two years and playing at home i think its equal no team is favourite for this match. both the teams are equal so its tough to choose winner thats the reason i choose both to score because i think it will be a high soring game.